In the wake of the Arab Spring, there are few dichotomies left in mass media. Producer and Consumer? Dead. Blogs started the battle years ago, when the “former audience” began to produce their own content. Now the former audience creates content not only for one another but also for broadcast media. Where would the 24-hour news cycle be without YoutTube videos and Twitter sources? New Media and Old Media? The distinction is becoming fuzzier. Yes, social media is new, networked, and peer-to-peer, but seemingly old media can be too. International television broadcasters like Al Jazeera are networked as well. They cover social media not as a sideshow but as a news source. They recognize citizen media makers as collaborators in the news-making and reporting process, not just kids with video cameras who need to turn their work over to the pro’s for it to be useful to others. If we can’t understand the 21st century media environment as a dichotomy, how can we understand it? Keeping with the environmental theme, I think a biological metaphor is in order: the trophic cycle of the food web. Trophic, from the Greek troph?, meaning”nourishment,” and refers to the movement and exchange of nutrients in the natural world. A plant photosynthesizes energy. The energy from the plant is eaten by a rodent, who absorbs that energy. The rodent is then eaten by a hawk or bear… or dies of a heart attack and is decomposed by bacteria. Why compare our current media environment to a food web like the one on the left? First of all, information operates in the media network like food operate in the web: both are discrete units that pass from organism to organism, changing a bit at each level of processing and reconfiguration, but still recognition: images, interpretations, dates, stories. Second, just as no organism is uniquely a consumer or producer of food, no media entity is uniquely a producer or consumer of information. Grass produces energy for the rabbit as it consumes energy from the sun. A citizen journalist captures a cell phone video of a protest which is later rebroadcast by a television station. Unlike the media dichotomies mentioned earlier, which are mutually exclusive, this duality of consumer and producer is complementary and contemporaneous: each consumer of news is also a potential creator of news, from the guys sitting on his sofa to the newspaper editor. Third, like food webs information networks are chaotic and unpredictable. Yes, a pig might be eaten by a bear, but he also might be eaten by Mark Zuckerberg or die of old age. In the same way an individual tweet or blog post or image might be picked up by CNN, by a few local blogs, or it might languish never to be relayed beyond its original audience. In fact, information networks are even more chaotic than food webs because while a single calorie cannot be consumed by two organisms at the same time, each piece of digital content can be copied an indefinite number of times simultaneously. In an environment with many media “organisms” of different sizes, complexity, and constitution, the path of any one piece of information is difficult to predict… or control. Autotrophic nourishment converts the physical phenomenon of sunlight into units of energy which other organisms can use. In the natural environment, plants are autotrophs. In the media environment, autotrophic behavior is the conversion of physical phenomena, like an event or piece of testimony, into a piece of usable information. In an earlier era only trained journalists were thought to be able to perform this task of converting events into publicly useful information. Now it is easier and easier to record and transmit events and anyone can act in the role of an autotroph. Heterotrophic nourishment uses energy that has already been converted into a usable form by another organism. 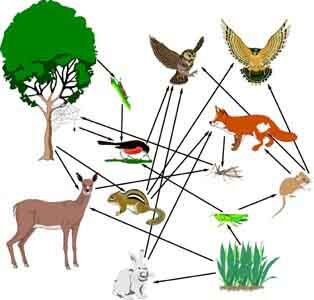 In the natural world, animals are heterotrophs. In the media environment, heterotrophic behavior is the consumption of units of information that have been created by another organism. It’s you reading a blog post or a listening to a radio news segment. It’s a TV producer watching a variety of citizen video and deciding which one is best fit for broadcast. It’s a newspaper journalist reading a press release and deciding if there’s a story there. And heterotrophic chains can be loooong. Just as a calorie can be transferred from the sun to a carrot to a rabbit to a human, a story can be transmitted from an eye-witness to a blogger to a tweet to a newspaper article. And there are an infinite number of pathways that any piece of information can travel. We are pretty good at tracking these units on discrete platforms (for example, Engine Room’s data set of #jan25 tweets), but when a piece of information jump between platforms, between media, and from offline to online, our methods of analysis fall short. Oh course, this is not a perfect symbiosis. Yes, professional media producers are more likely to act as autotrophs and convert their own information. Yes, most citizens are more likely to consume existing information that create their own. But any individual can act in either an information autotrophs or an information heterotroph at any time, and this keeps things interesting. Would the analogy between food web and media network break down at the level of specific mechanisms? Of course it would. Is it still a useful metaphor for the increasingly interconnected media environment and the dual nature of each individual within it? I think it is. Now it’s time for a midnight troph… I mean snack. College biology class proves useful after all!